Foreign direct investment (FDI) has been a pillar of strength for India in recent years. Prime minister Narendra Modi could lean on the steady flow of dollars and tell voters that the world outside had more faith in his government than his rivals at home. It helped that the world was awash with cheap money for the last few years, thanks to near-zero interest rates in developed economies like the US, Europe, and Japan. But things are about to change. With interest rates rising in the US, people will have to pay more for dollar loans, which means capital won’t remain as cheap anymore. Add to that the political milieu in western countries pressing firms to prioritise bets based on the needs of the domestic economy. For instance, US president Donald Trump’s recent tax reform has imposed a tax on overseas profits of companies. A recent report from the Organisation for Economic Cooperation and Development, an inter-governmental body with 35 member countries, has warned of a reversal in the global investment flow. “Looking ahead, this is likely to reduce FDI flows in 2018 as US companies repatriate cash due to the one-time tax on undistributed foreign earnings included in the tax reform,” the April report said. 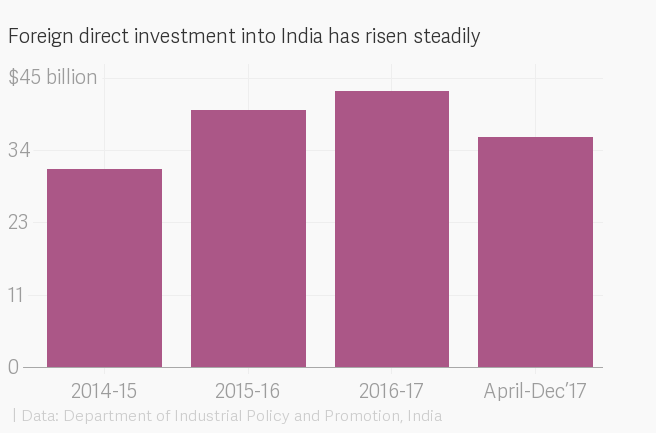 The early signs of this shift are visible: India has slipped three places in the AT Kearney FDI (foreign direct investment) Confidence Index. The annual survey by the consulting firm AT Kearney ranks markets that are likely to attract the most FDI in the next three years. In fact, Asia’s third-largest economy has skidded out of the top 10 countries on the global investors’ radar for the first time since 2015, according to the report released on May 02. The fall in India’s ranking is in line with the declining appeal of emerging markets. China, too, has slipped down two spots to fifth spot, the lowest ever in its history. Overall, global capital is moving towards bigger and more developed economies. “This growth is likely a result of stronger economic performance across developed market economies, their competitive advantages in technological innovation, and the regulatory and competitive pressures to localise operations in core markets,” the AT Kearney report said. As inevitable as the changing course of investments may seem, there are some reasons particular to India that may have capped the country’s potential. “Some policies, however, may have deterred investors—at least in the short term. The 2017 nationwide goods and services tax (GST), for example, has faced implementation challenges, and the 2016 demonetisation initiative disrupted business activity and weighed on economic growth,” the AT Kearney report noted. 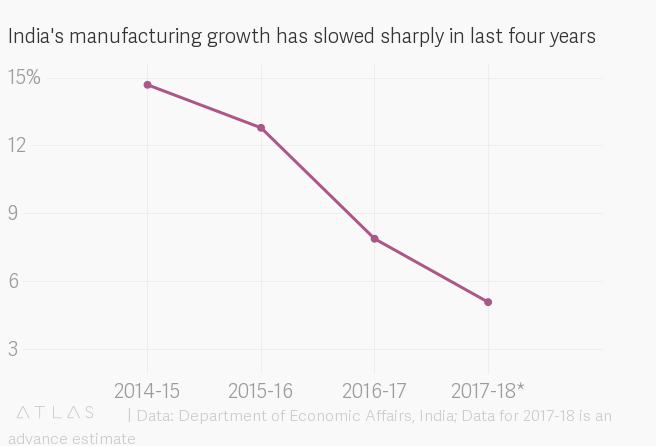 The flow of FDI is crucial for India’s manufacturing sector, which has been in the doldrums recently. Local investors have been penny-wise and new jobs have been scarce. The government’s goal to make 25% of the country’s gross domestic product (GDP) by 2025 from manufacturing, which currently accounts for about 18% of the GDP, seems like a long shot.